Community Blog by nekobun // A Humble Bundundrum: are indie bundles losing their way? Back when it debuted in May of 2010, the first Humble Bundle presented something new and interesting, especially to those gamers out there on a budget. Serving up a fistful of indie games that were already receiving varying levels of buzz, potential customers were given the option to pay what they wanted for the bundle, and further customize their contribution by setting how much of their payment was to go to each game's developer, and how much would go to charity. Despite being mostly unprecedented (outside of the Steam-sale bundles that inspired it), news of the deal that was the Humble Bundle spread via social networking and discussion websites, and the bundle broke $1 million in sales before its end. Since that first outing, the bundle scene has exploded. With the Humble Bundle itself now twenty-one bundles deep, with exploration into non-game realms such as music and books, and other discount game compilations cropping up all over the place, it seems as if the bundle model should be providing indie developers with a new way to get their games into players' hands and build support for potential future titles, as well as combating piracy to some extent and renewing faith in the generosity of gamers in general. To some extent, this has been the case, but certain trends seem to be developing that may or may not be warning signs regarding the state of the bundle scene. 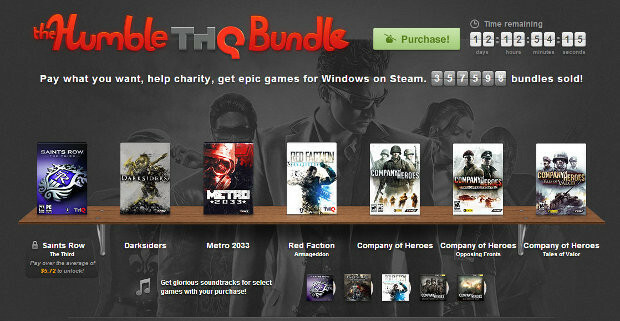 One of the most recent examples, having occurred as November slid into December of 2012, was Humble's THQ Bundle. Sure, the Humble guys were known for doing developer-centric bundles before, offering batches of games from Frozenbyte, Lexaloffe, and other developers, as well as teaming up with outfits such as Mojang and Double Fine to provide games from their Mojam and Amnesia Fortnight jams, respectively, but this was the first time a Humble Bundle had been tied to a big-name, albeit flailing, publisher. Sure, it beat $5 million in sales and got some great games into the hands of players who may not have been able to grab them previously, but, as recent news has shown, it certainly didn't save THQ's bacon, and it was a departure from a history of helping out self-publishers who probably needed the money more to eat than to keep a sinking ship afloat. It may not signal the end of an era, but it's a bit worrisome to think the Humble Bundle may be able to squeak by on their history and name after the stink raised when EA compiled their own "indie" bundle on Steam back at the beginning of the year. A more widespread, but less noticable issue in the bundle scene, is the dubious quality of some of the offerings out there, with old, dust-collecting titles being thrown together more in the interest of garnering a quick buck off ill-informed bargain hunters than in helping out any developers who could use a hand. While having started out well enough, with relatively current titles such as Hacker Evolution, inMomentum, and Your Doodles Are Bugged in its very first outing, Indie Gala is arguably the most prominent of the bundle sites experiencing this sort of drift. As they've worked their way through fourteen bundles to date, the initial three to four year timespan for release dates in Indie Gala contents has expanded to include more and more games that are half a decade or more out of date, the most egregious example having been the original Worms, featured in Indie Gala 9 despite having come out in 1995. To be fair, Worms still holds up, but it and the other dated Worms titles in IG9 seem like filler, if anything, as well as being guilty to some extent of Humble's THQ maneuver, as Team17 and the Worms franchise appear to be doing well enough without any bundle's aid. Sure, this lack of temporal focus has uncovered some delightful gems, with the same Indie Gala 9 also offered the first three Broken Sword games, but there are just as many titles from this and other bundles that may have well stayed forgotten. Even when more current games are being featured, there often leaves something to be desired in terms of quality control of the games that do make it in. While I hate to harsh on anything into which a team has put a decent amount of time and effort, more and more bundle offerings seem like barrel-scrapings that the bundle builders were able to get their hands on more easily. Again, Indie Gala gets a nod, as there's been increasingly more mediocrity in the past few offerings, though that could, again, be in part due to the increasing ages of the games they choose to bundle. Other bundles, however, are not as innocent. 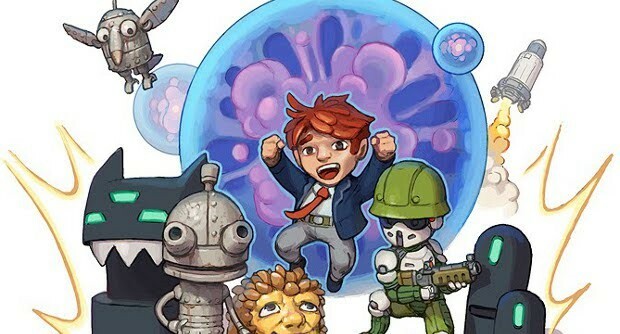 Both magic pony raising simulator and snooze-fest Secret Of The Magic Crystals and general disaster Revelations 2012 have been on offer in different batches provided by the bundle site Groupees in recent months. While the former was in a Build-A-Bundle, which allows buyers to pick and choose which games they want, Revelations 2012 was the headliner in the Be Mine 4 bundle, which featured generally respected games like Guns Of Icarus, Dwarfs! ?, and Metal Drift. One could argue it's a great, low-cost way to witness a trainwreck one wouldn't have otherwise paid to partake in, but it still raises concern when rubbish seems to be interloping its way into things. The worst offender thus far, on both counts of garbage and aged goods, along with a side of shady practices, would have to be Indie Face Kick. Their most recent bundle offered up several steaming piles, including 2006's on-rails get-shot-fest, Desert Gunner; the same year's clumsy, half-baked post-apocalyptic mess, Hard Truck: Apocalypse; and my personal favorite, Operation Matriarchy, a generic first-person shooter from 2005 that shipped with corrupted audio files that were never fixed, outside of fan-made mods that may not even work properly for some. 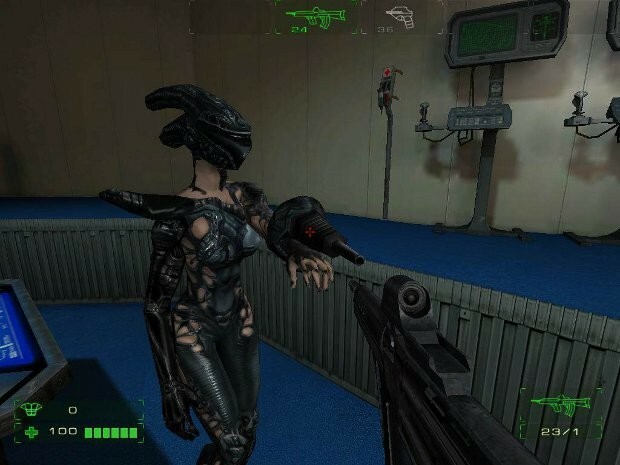 Recently, the crew at Indie Face Kick have been in a legal tangle with Biart, the developers of mediocre-but-playable Depth Hunter and the widely panned Deep Black, over the inclusion of the latter as a bonus in their second bundle, though Biart have been firing back over Indie Face Kick's lack of payment for sales of Depth Hunter in that same bundle. Hopefully, it's an isolated incident, but it shows that some bundlers may be cropping up to help themselves more than anyone else. So, what bundles are worth it? Well, despite being somewhat questionable with the THQ Bundle, and their standard policy of offering a single Steam code for an entire bundle rather than codes for each game (which would allow those buyers who already have some of the bundled games to pass the extras along), The Humble Bundle have proven themselves time and again to be trustworthy, and have the clout necessary to gather some of the finest indie games out there. Hot on their heels are Indie Royale, who crank out bundles on a regular basis, tie your purchase history to some extra bonus rewards, and centralize your bundles on one page tied to your account, should you ever need to re-download anything. Additionally, Indie Royale is partnered with Desura, so your new purchases will appear immediately on your Desura account, whether or not you choose to redeem the Steam codes, which is fairly convenient. And, despite a couple of slips in the quality control department, Groupees is a great site for bundles of all kinds, be they bundles of games, music, or even e-books and digital comics. Their game bundles, branded under the Be Mine name, tend to offer some fairly interesting selections and piles of bonus material, and their Build-A-Bundles, as mentioned earlier, give you the freedom to pick which offerings you want, and provides base and suggested prices once you've made your selections. For those curious about the many titles being thrown up for voting on Steam Green Light, The Green Light Bundle compiles several candidates now and then in low-priced bundles for your perusal to try and get some votes going, and offers Steam codes for those games that make the cut once they're officially on Steam. Finally, while their bundles are fewer and far-er between-er, Bundle In A Box is one of the more recent entries to the bundle realm, and consistently offer a great selection of mostly-unknown titles, usually centered around some sort of theme. Also worth keeping an eye on are the markets that seem to be spinning off the bundle system as we know it. A few months ago, Indie Gala launched their Gala Store, which offers deals on a wide variety of games, both from previous bundles and stand-alone, which usually come at a discount and can see further price lowering using the Gala Points earned from buying Indie Gala bundles. Additionally, they have mini-bundle deals going on pretty much constantly, usually featuring two or three games at a super-low price for as many days. Another site offering similar, small-bundle deals is Indiebundle.org, which evolved from the short-lived Indie Underdog Pack and offers three-game bundles of mostly unknown games for five dollars a pop. Given the quality of the obscure goods they served up in the IUP bundles, I'd say they're worth investigating. Thirdly, Indie Game Stand has taken the pay-what-you-want model of bundles and applied it to individual games, doling out a new game for whatever you can pay every four days, but offering bonus content to anyone who beats the suggested price, which is usually ten dollars. In a world where Steam sales seem to dominate gamers' wallets, and grow to be a more and more regular occasion each year, it's nice to see an alternative in these bundles giving non-Steam titles a push and a chance at expanding their audiences. Even with some bumps in the road and the possible beginnings of drift from their original, altruistic intent, the bundle ecosystem is still a healthy and growing alternative to established means of distribution, and we can only hope it continues to thrive. If anything, with increased popularity and further patronage will come greater scrutiny, helping to quell less honest bundles and keep the good ones thriving.